We are aerial specialists in video and photography; available for custom aerial productions or as a resource for aerial stock footage. 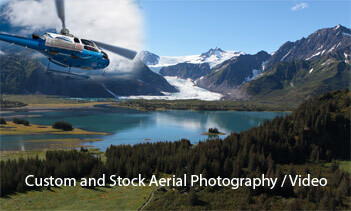 Our collection of HD aerial stock footage of Alaska includes clips of Anchorage, Seward, Mat-Su Valley, Kenai Fjords National Park, dog sledding, glaciers, sea stacks, icebergs, cruise ships, adventure vacation spots and many other vistas around south-central Alaska. If you don't see what you are looking for or if you would like help finding something please let us know. We have much more footage we are adding to our inventory. Footage is priced at $50 per second for broadcast use, with discounts in place for purchases of 30 seconds or more. Please give Brandon or Decker a call to discuss. To view our collections please select our Youtube Playlists or for quick review, select one of the videos below.